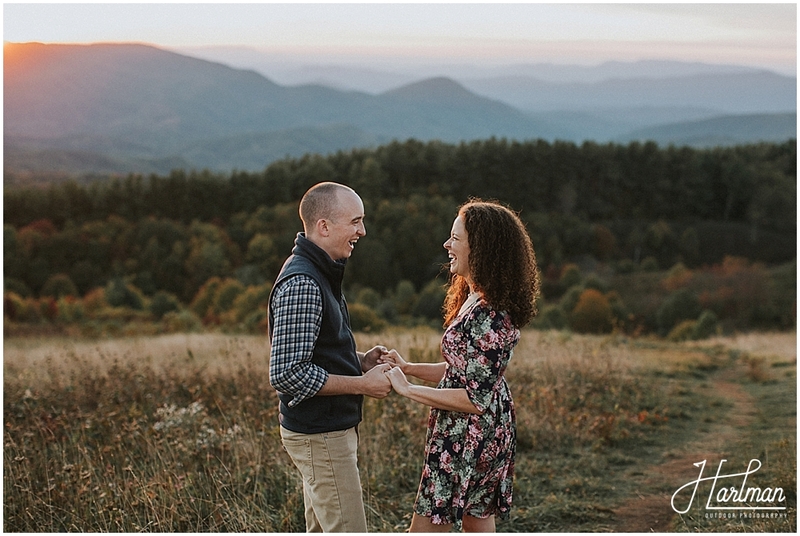 Josh and I were so happy to meet up with Katy and Nick outside of Asheville as we camped at Max Patch Mountain. 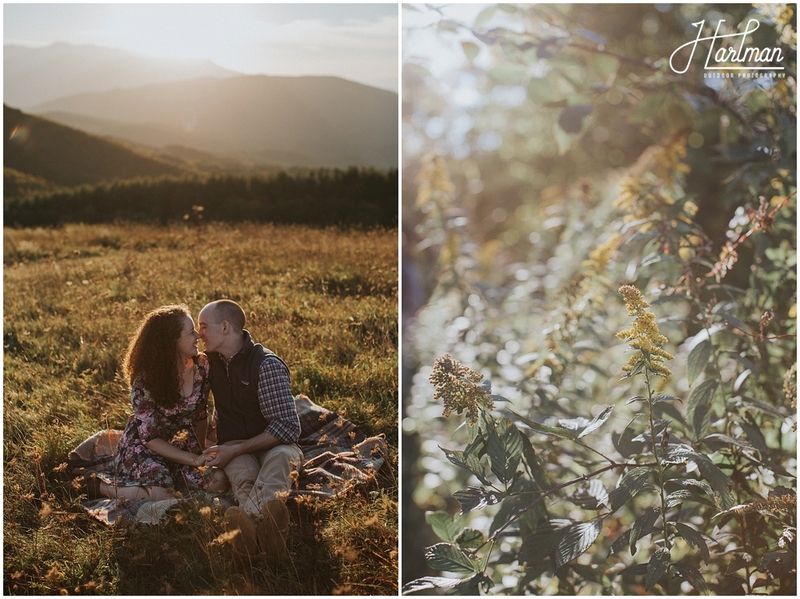 We had just booked a wedding with them out in Glacier National Park next summer and were so eager to meet up and hang in the mountains. 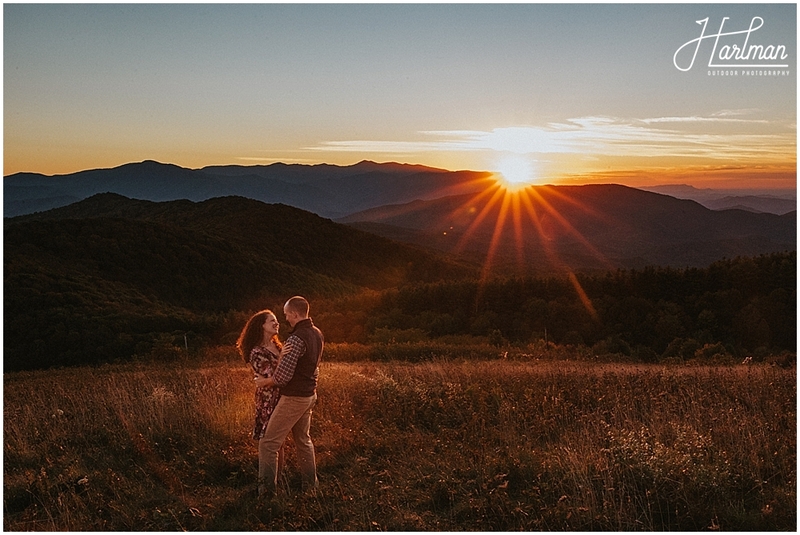 We parked our camper right there in the parking lot at the base of Max Patch Mountain. 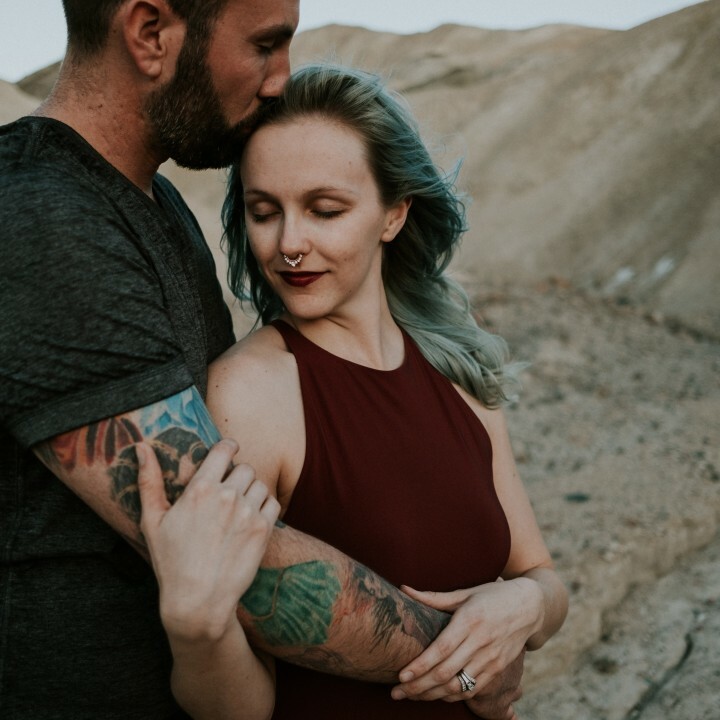 Conveniently, we were even able to offer our Casita as a little changing room/ prep area for Katy and Nick after they made the drive up the long dirt road. 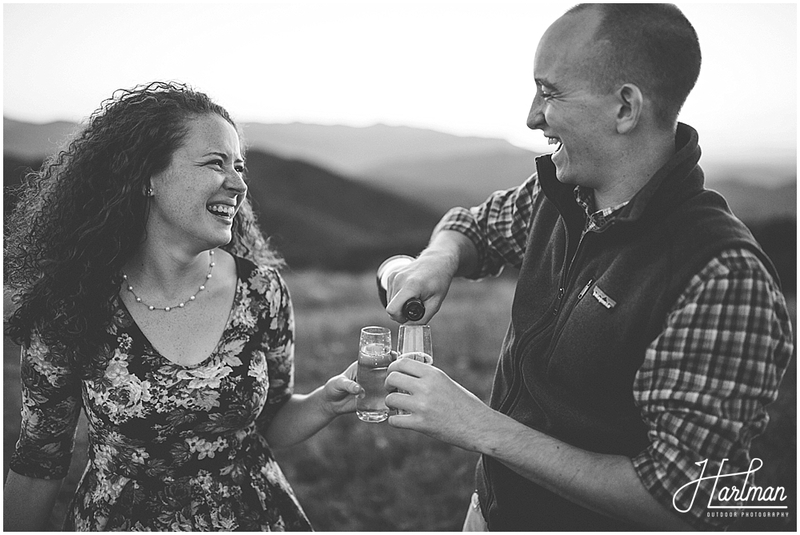 The sky was perfectly clear this day, so we also took a little time to relax and sip some champagne in the camper as the sun softened a bit. 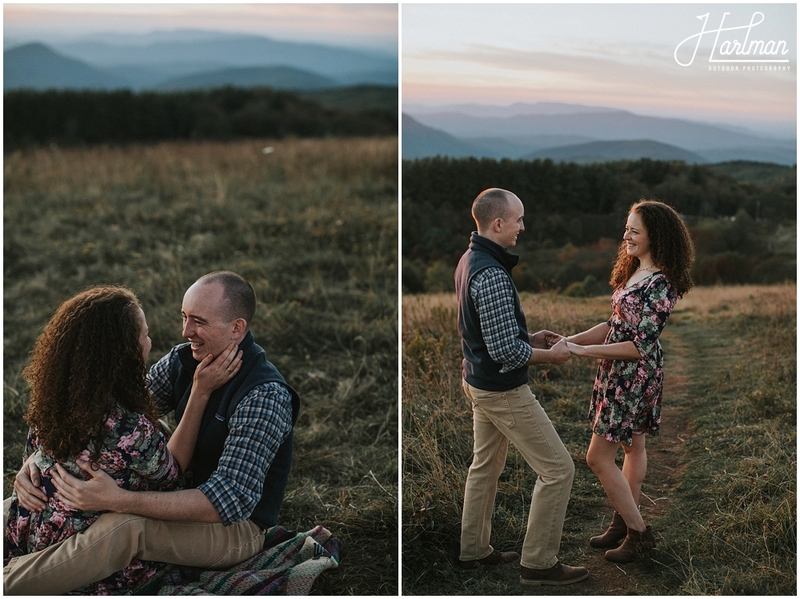 This was our first time doing anything like this, but it made us wish we could do it every time! 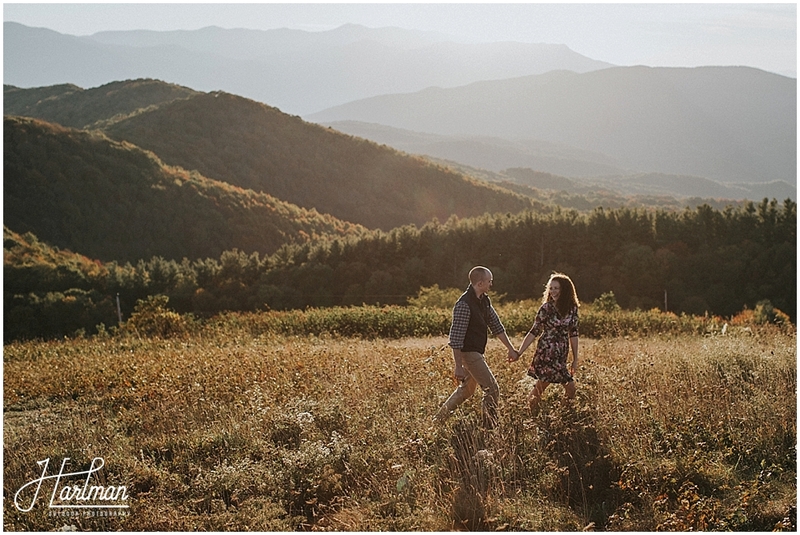 After a couple glasses of champagne, we headed out onto the mountain to a path among the trees. 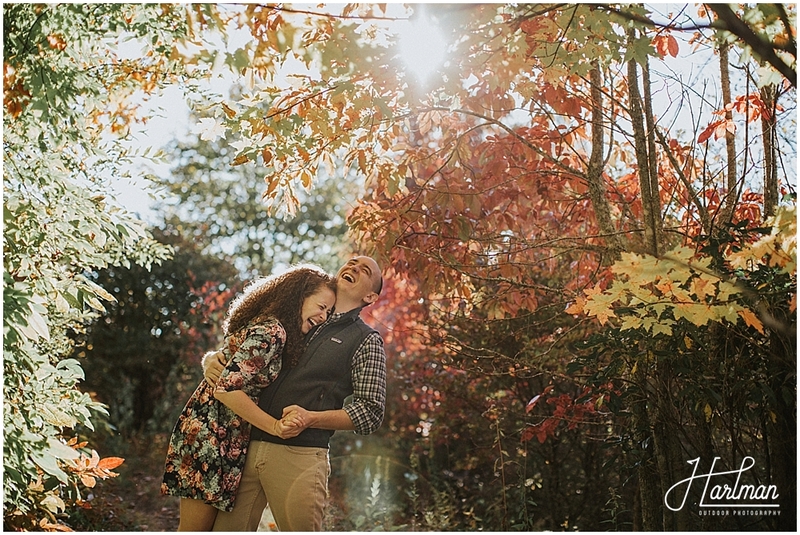 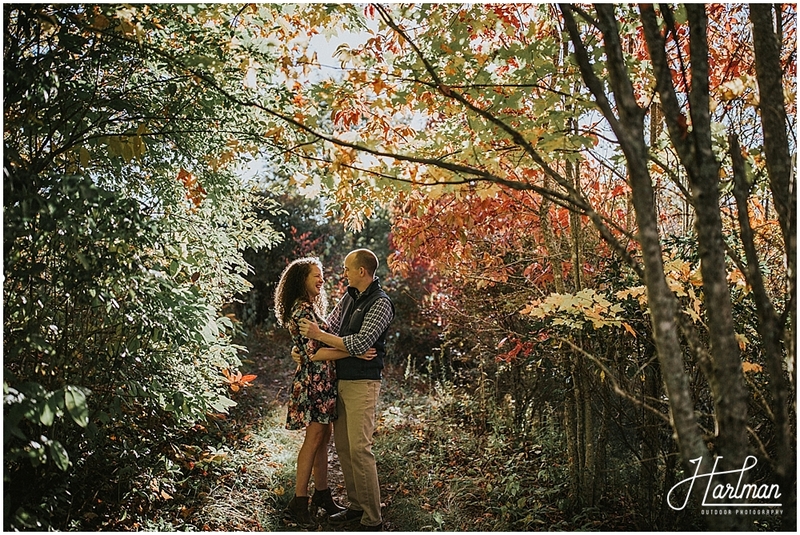 The colors were just starting to pop in Asheville, and we found some beautiful leaves. 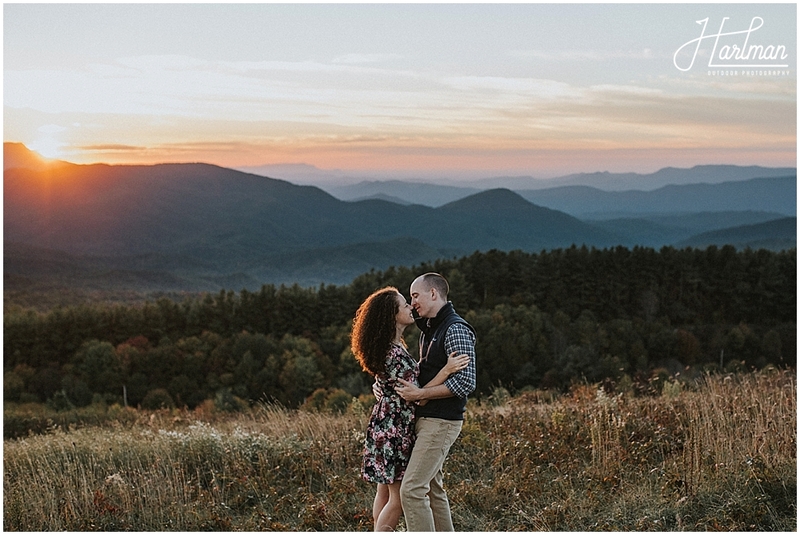 As the sun got even lower in the sky, we headed up to the top of the mountain to catch the sunset over the Blue Ridge Mountains. 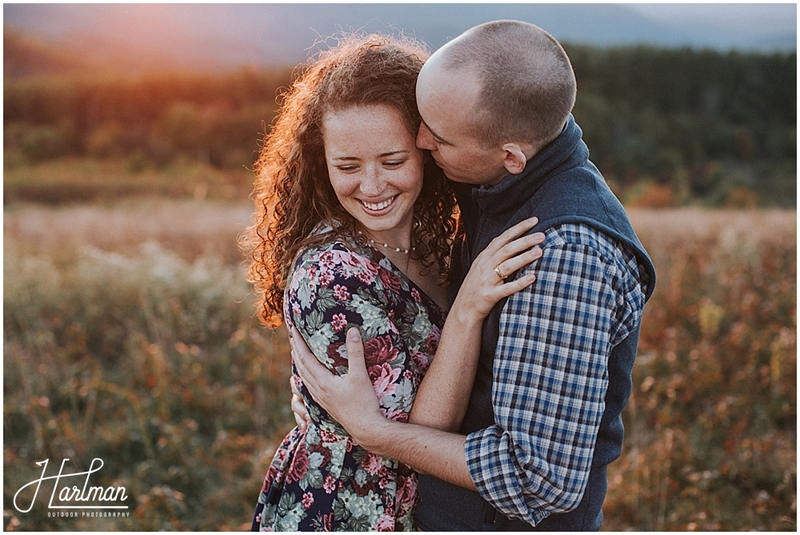 The sunset was golden pink and I just love the way it glowed through Katy’s hair. 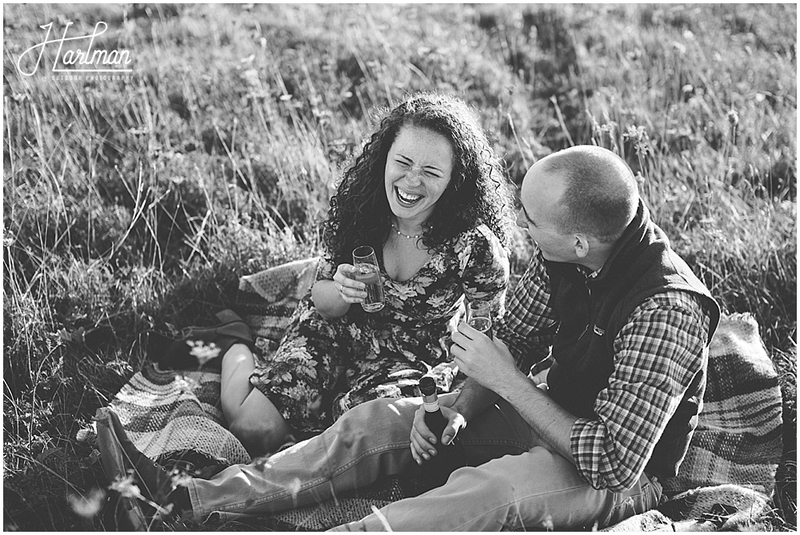 We stayed out way through dusk- popping yet another bottle of champagne and relaxing on the Scottish blanket Katy and Nick bought on the trip where they got engaged. 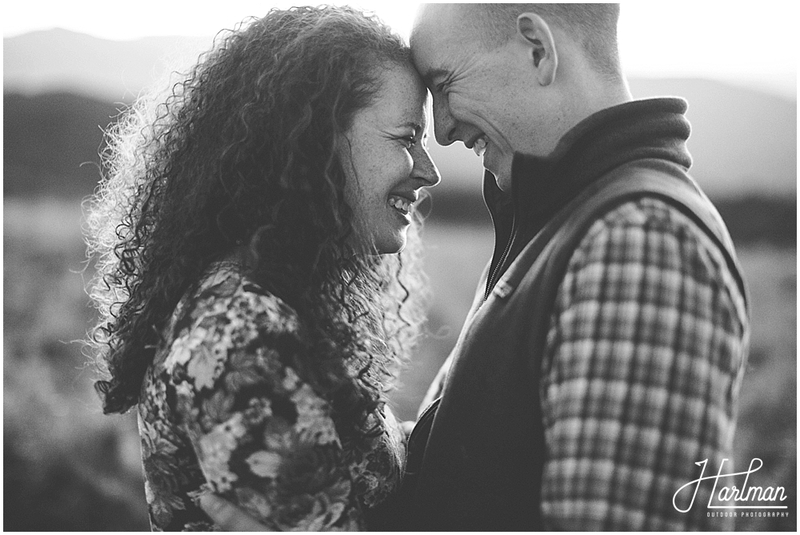 All the while we shared funny stories. 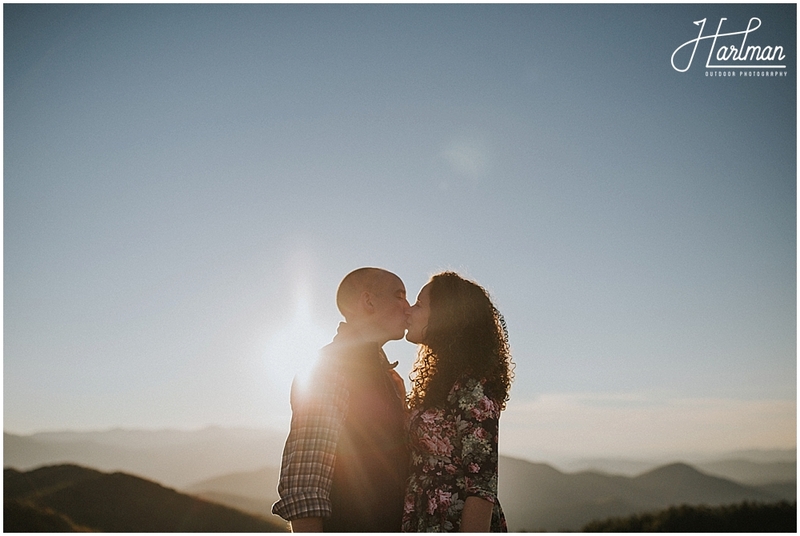 It was really such a great time. 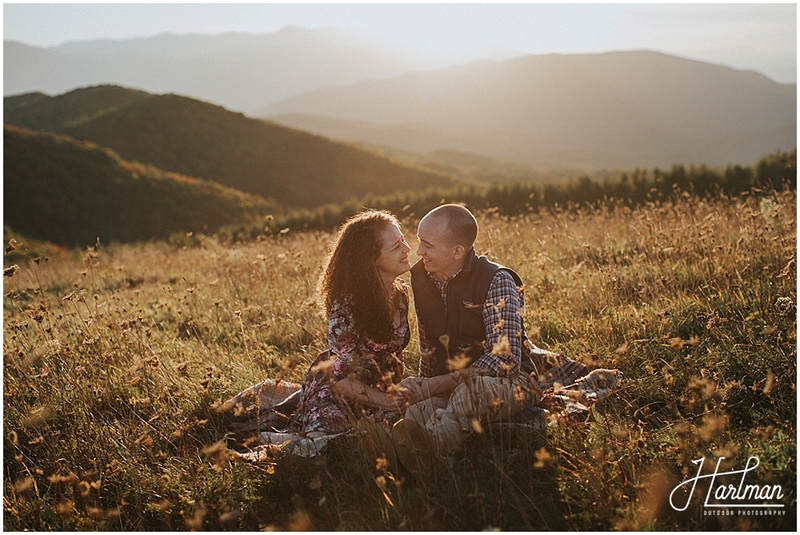 We cannot wait to meet these two and their families out in Montana next summer! 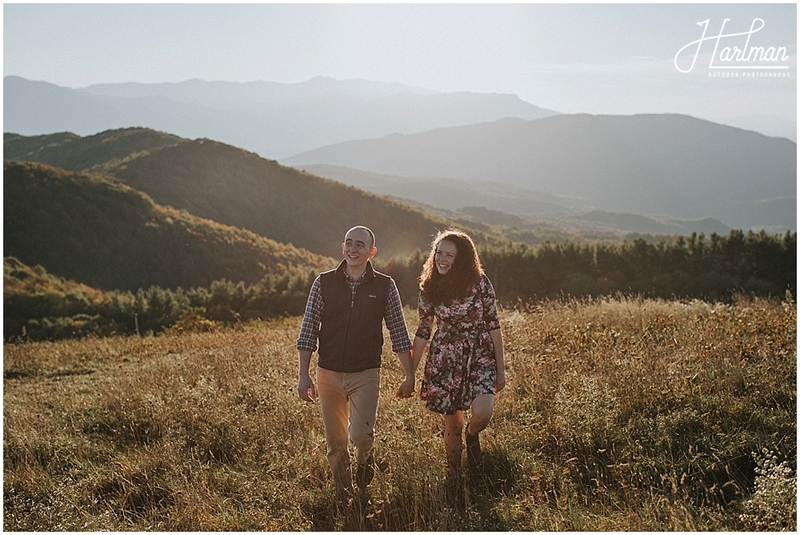 Want to see more of Max Patch Mountain? 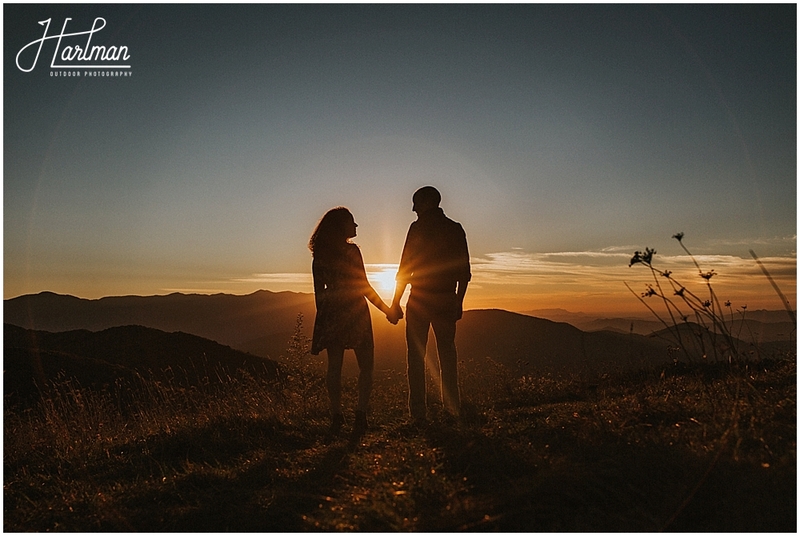 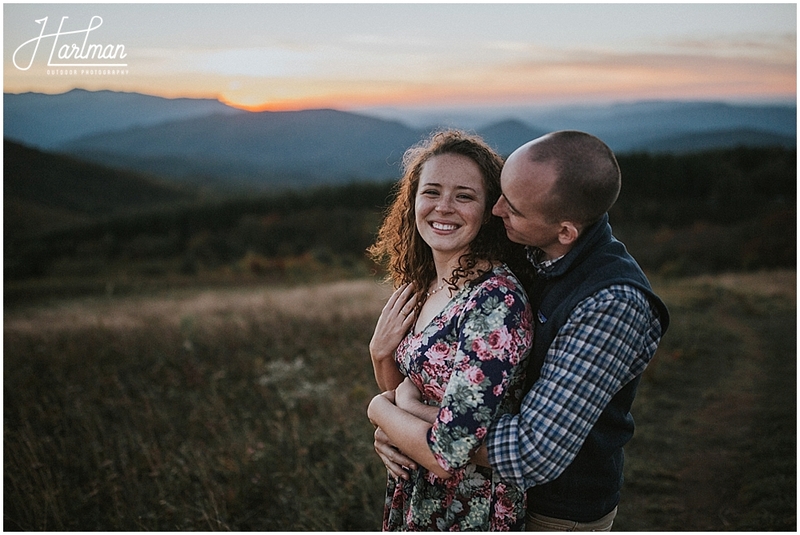 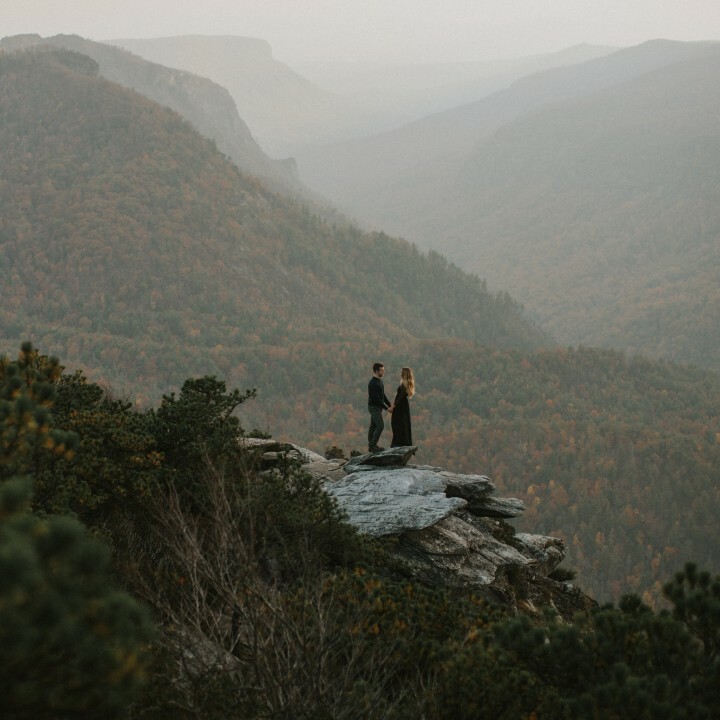 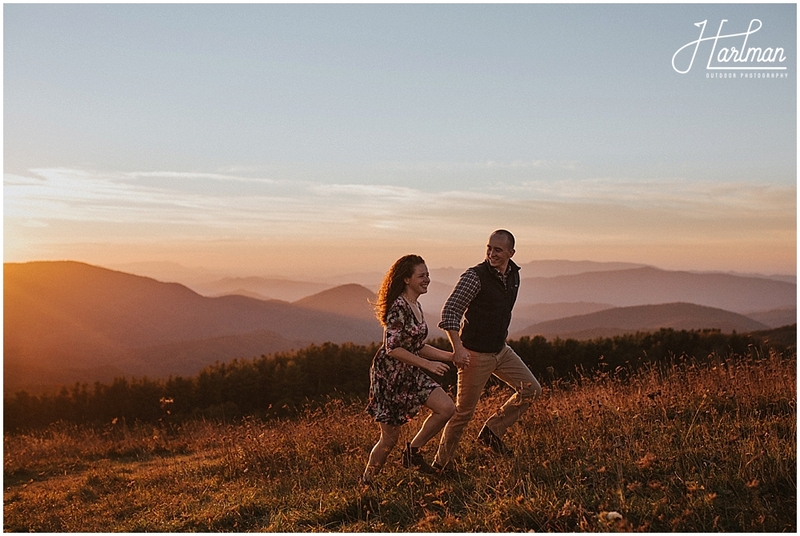 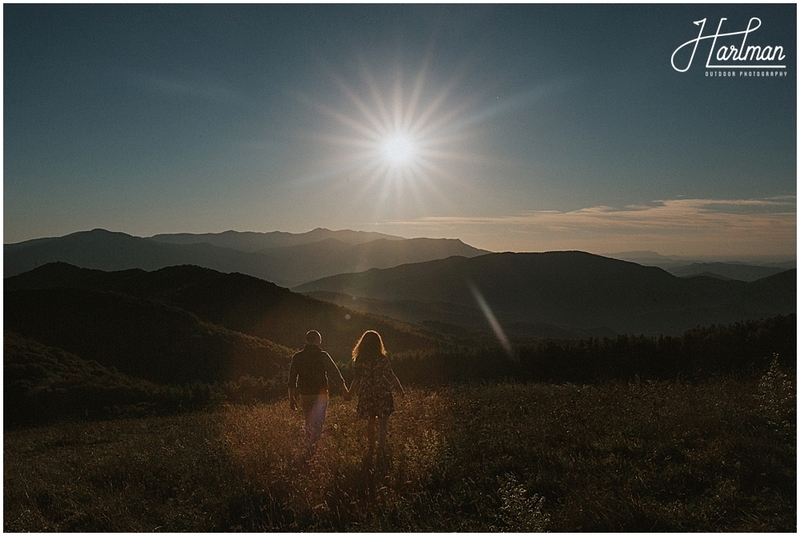 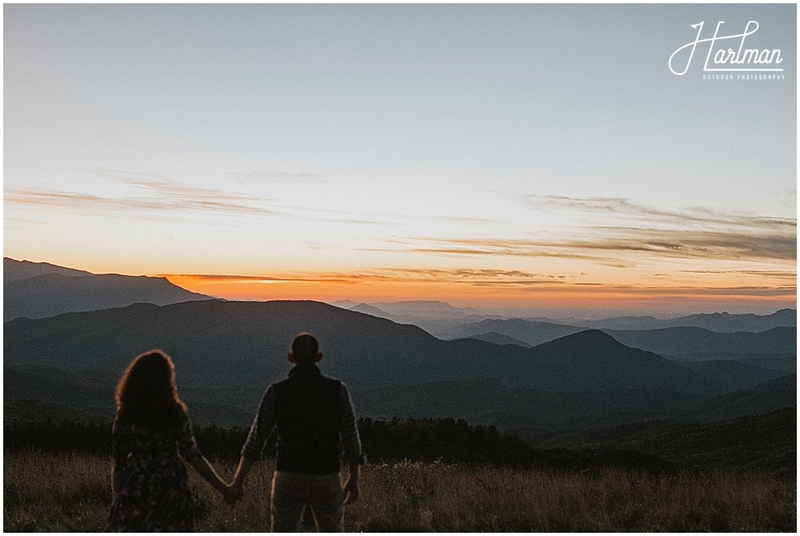 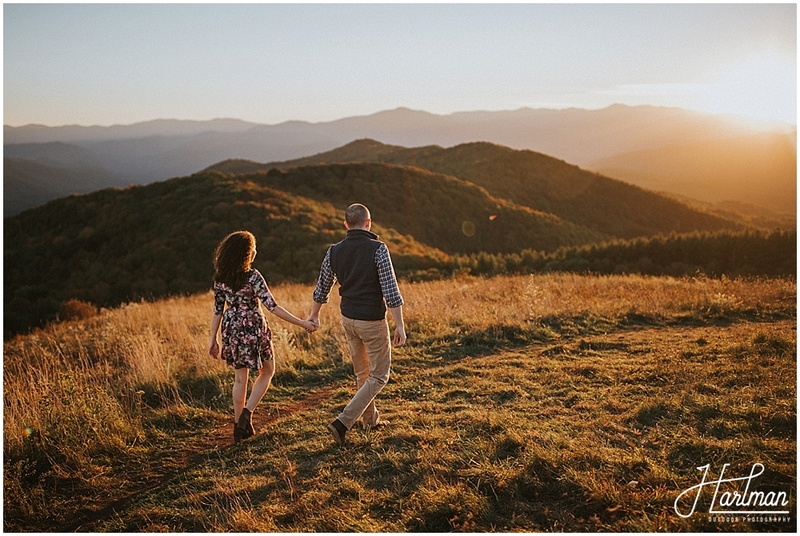 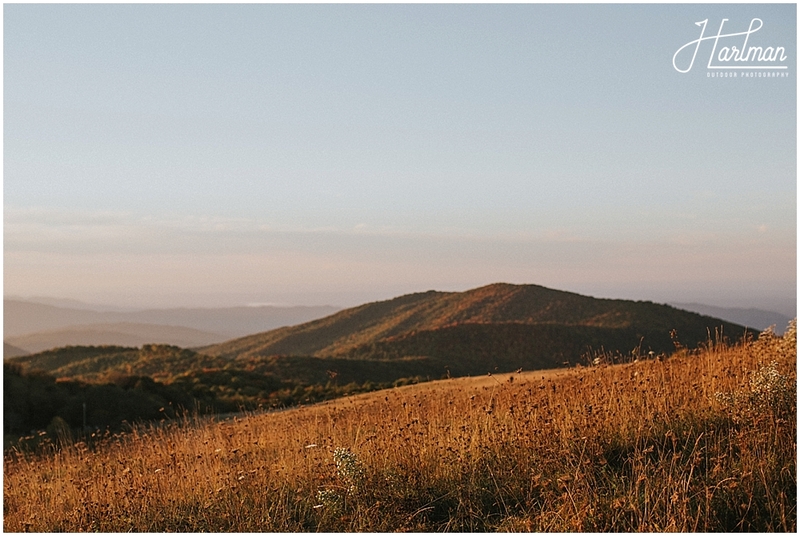 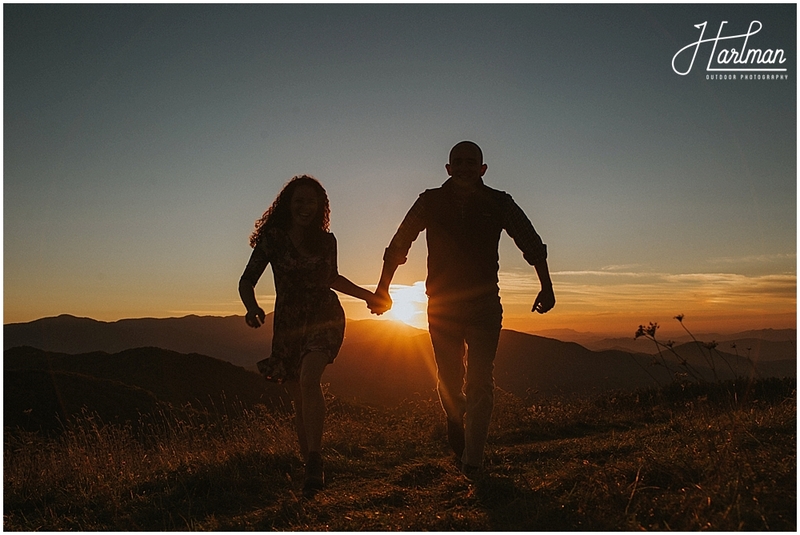 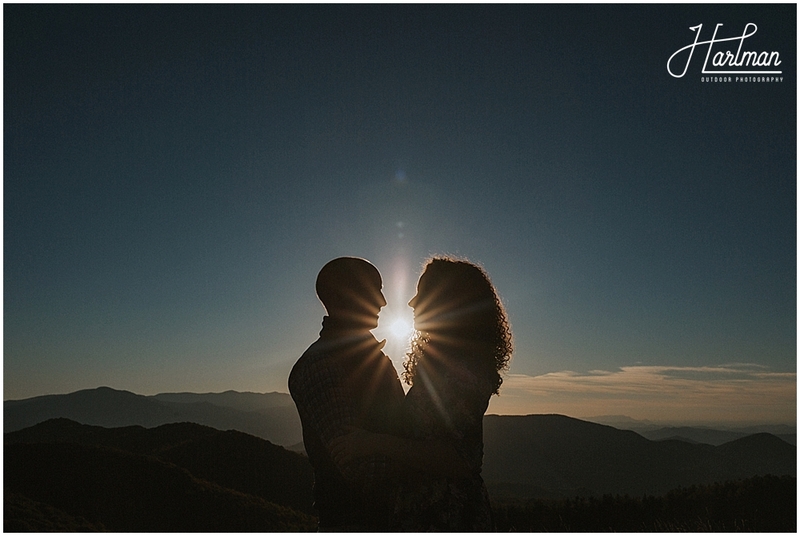 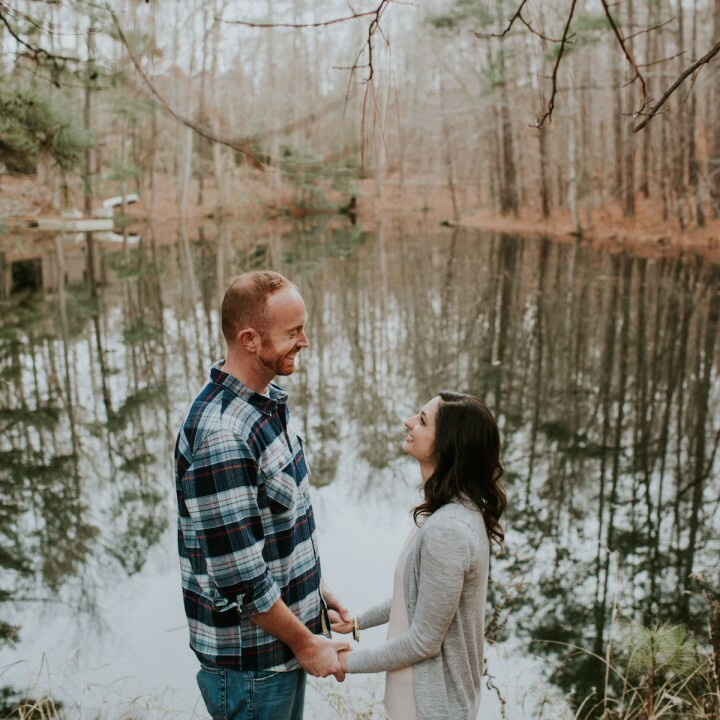 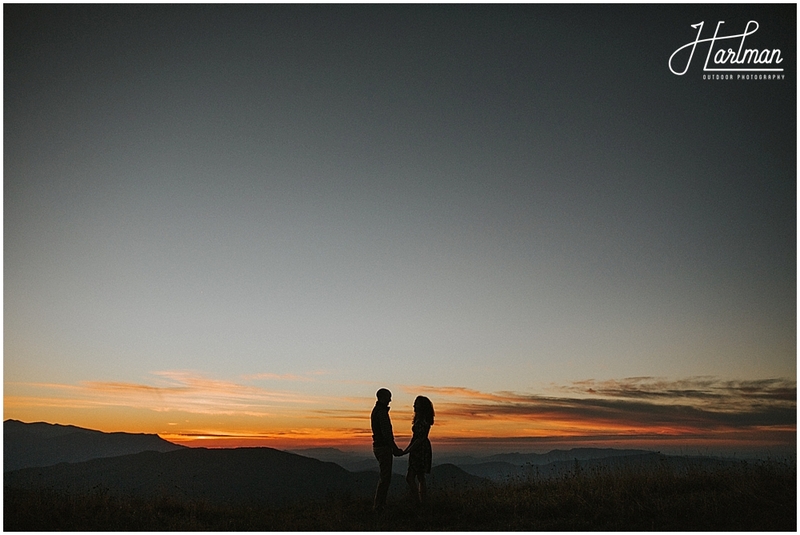 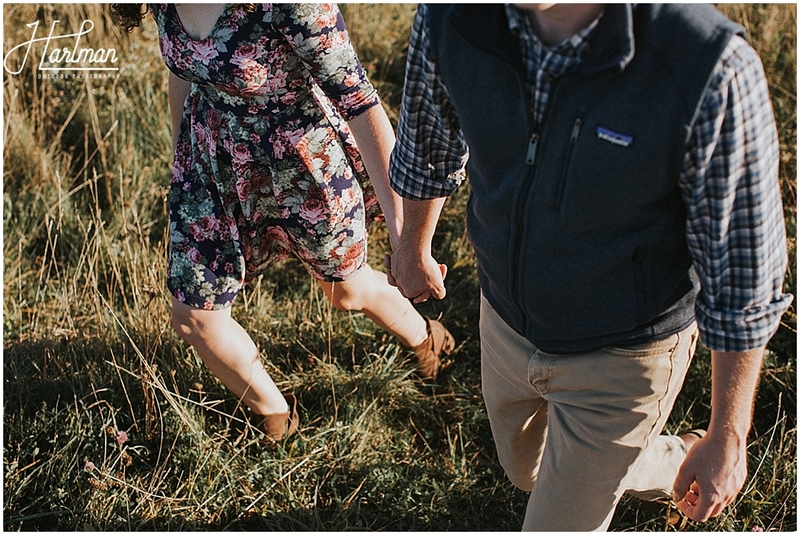 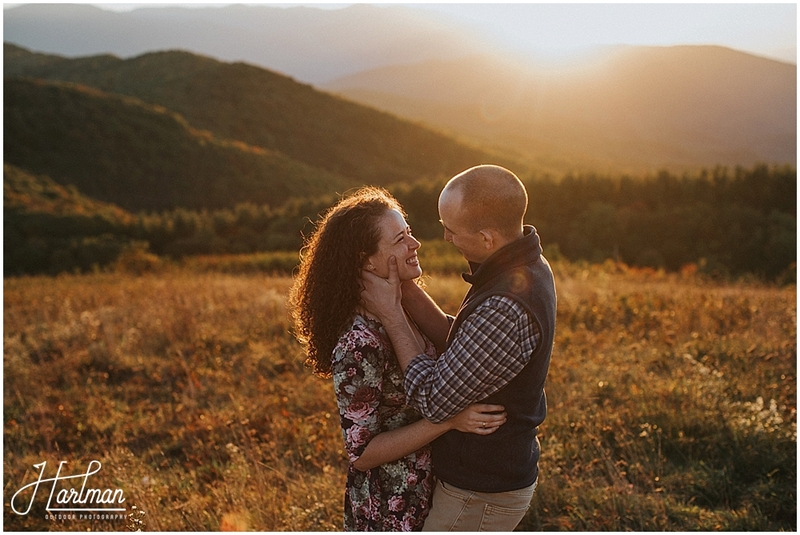 Check out our recent mountaintop Asheville elopement.